East Midlands Ambulance Service joined other blue-light services in response to the devastating fatal road traffic collision on the M1 today, Saturday, August 26, where eight people died. During the early hours of today, East Midlands Ambulance Service was called out to the crash at the M1 near to Newport Pagnell involving a minibus and two lorries which has claimed eight lives. The crash happened on the southbound M1 at Newport Pagnell in Buckinghamshire just before 3.15am. All of those who died are believed to have been travelling in the minibus which was from the Nottingham area. The initial call to EMAS was received from South Central Ambulance Service at 3.27am to make EMAS aware of the incident and the potential need for support. Shortly after that it was confirmed that EMAS resources would be required and they sent a Hazardous Area Response Team, a National Inter-agency Liaison Officer, an Ambulance crew from our Northamptonshire division, a doctor from the East Midlands Immediate Care Scheme and a doctor and paramedic who were off-duty and responded as Medical First Responders. Other emergency ambulance support teams were also at the scene including South Central Ambulance Service, East of England Ambulance Service and Magpas Air Ambulance. EMAS Liaison Officer Mr Sharpe added: “The road traffic collision on the M1 during the early hours of this morning was a very serious, tragic incident. From the incident EMAS took a patient in an ambulance to hospital in Birmingham, accompanied by the Magpas Air Ambulance enhanced doctor and paramedic team. Four people have been taken to hospital, including a child, Thames Valley Police said. The crash happened on the southbound carriageway of the M1 at Newport Pagnell near Milton Keynes with the vehicles all travelling in the same direction between junctions 15 and 14, according to Thames Valley Police. Buckinghamshire and Milton Keynes Fire and Rescue Service said it had sent six crews as well as three search and rescue vehicles to the scene. Firefighters used hydraulic equipment to release three people from a vehicle. 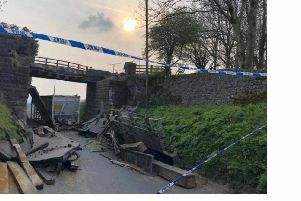 The incident is the subject of a Thames Valley Police investigation and the two lorry drivers have been arrested, one of them on suspicion of driving while over the alcohol limit. Both men are being questioned on suspicion of causing death by dangerous driving and are in police custody. Thames Valley Police said the two lorry drivers, one aged 31 and from Worcestershire, the other aged 53 from Stoke-on-Trent, were being questioned. The 31-year-old man was detained on suspicion of one count of causing death by dangerous driving and one count of driving a motor vehicle when above the legal alcohol limit. Anyone with any further information about the incident should call the 24-hour Thames Valley Police enquiry centre on 101 - quoting URN 203 of 26/8. The road was closed for several hours between Junctions 14 and 15 and was re-opened just after 1pm. Northamptonshire Police asked people travelling to the British Moto GP at Silverstone to allow more time for their journey. The carriageway reopened just after 1pm.